We have been yearning to go out on a nature trip for quite some time now. Finally we had a chance, but the question is where do we go? 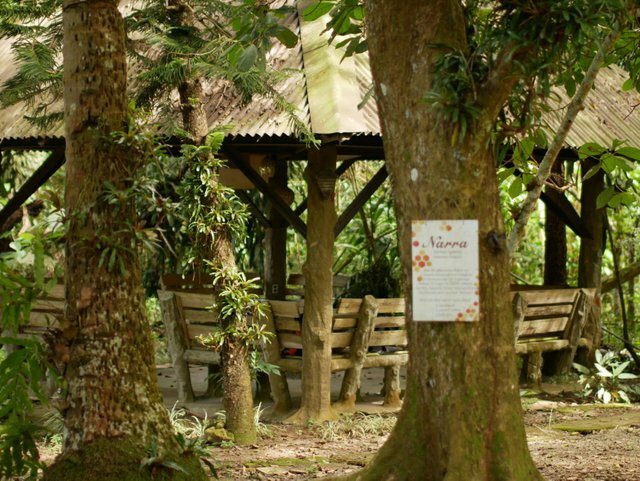 A place we have never been and at the same time a good learning experience for the kids. 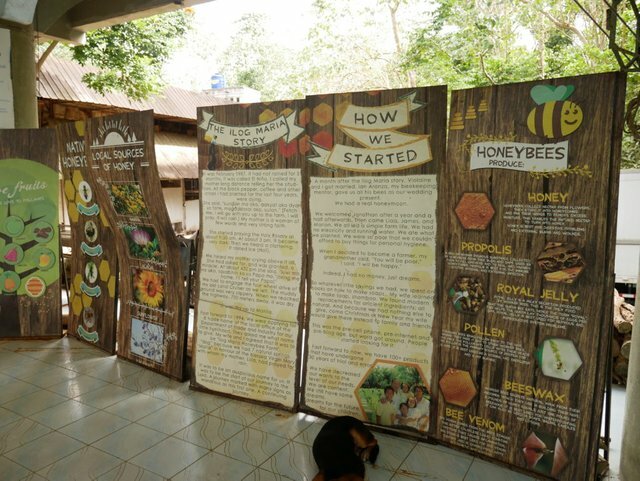 First thing that came to my mind was something sweet and I realized that we always wanted to visit a honey bee farm. Off we went on a two hour travel to visit a place hidden away along the highway. 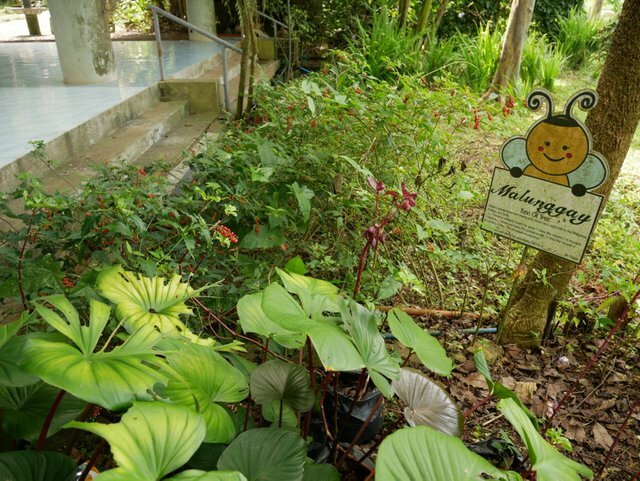 Come join me today as I take you to a quiet place where the busy bees work all day. Since this is the first time we are visiting this place, we used Waze which is a popular navigational app. With the up you will never get lost and we easily found the bee farm. From the highway we took a turn and followed a dirt road leading to the place. 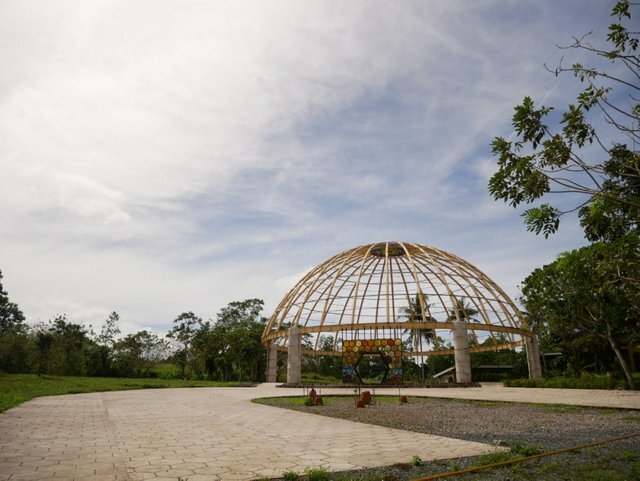 After a few minutes there was a big open space and a big dome greeted us in this beautiful morning. The hexagonal shapes on the painted glass gave us a sign that we have reached our destination. 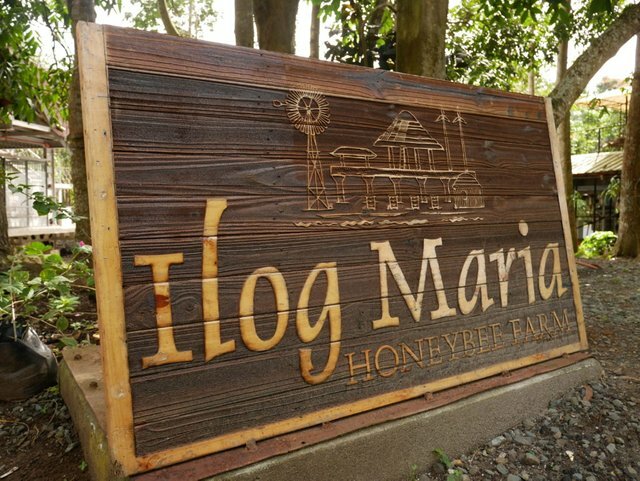 The name of the farm is "Ilog Maria" located in Silang Cavite in the Philippines. There is a short story behind the name of the farm. There was a time when there was no rain for 5 months and the crops of this farm were dying. The owner called his mother to tell her about the bad situation of the farm. The mother immediately requested to be brought to the farm so she could pray. When she reached the farm she prayed from morning till afternoon. The skies darkened and miraculously a thunderstorm came which lasted for almost an hour. 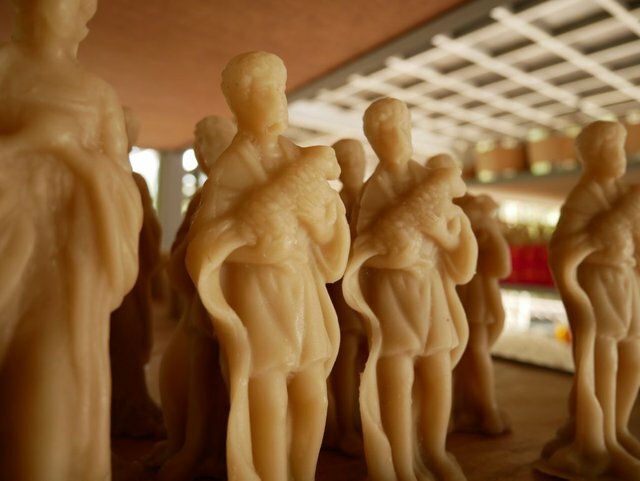 With this miraculous act they named the farm Ilog Maria to honor the Virgin Mary to whom she prayed to. The air here was fresh and the sound of the gentle breeze could hum you to sleep. Immediately, I scouted the place and saw the beehives scattered all over the place. I see the bee hives, but couldn't see the bees. Where are the bees? I was expecting that there would be thousands of bees flying around. 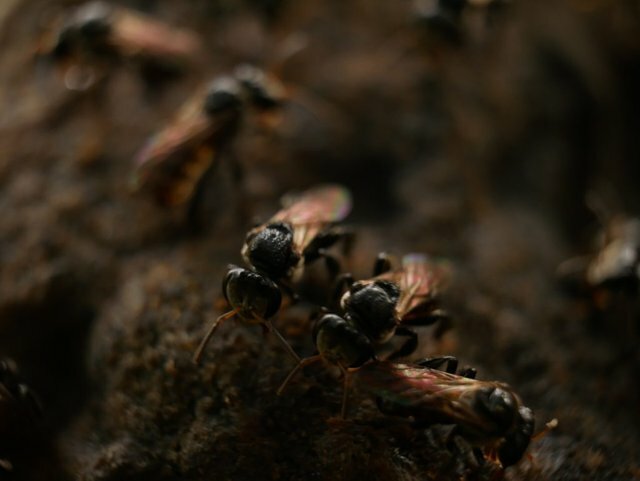 Initially, I was a bit worried of being stung by them, but I could not see any of them. I asked one of the employees where the bees are located. I was directed to the right side of the farm and was advised not to do anything to stress the bees. 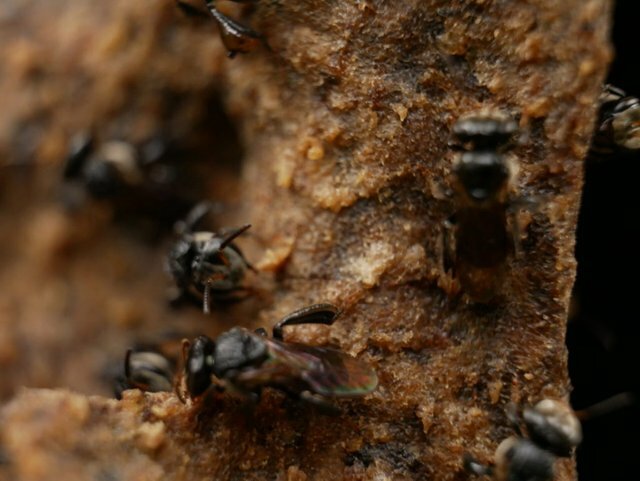 The bees in this colony are stingless, but they do bite when agitated. With much excitement I took out my gear and quietly entered the area. 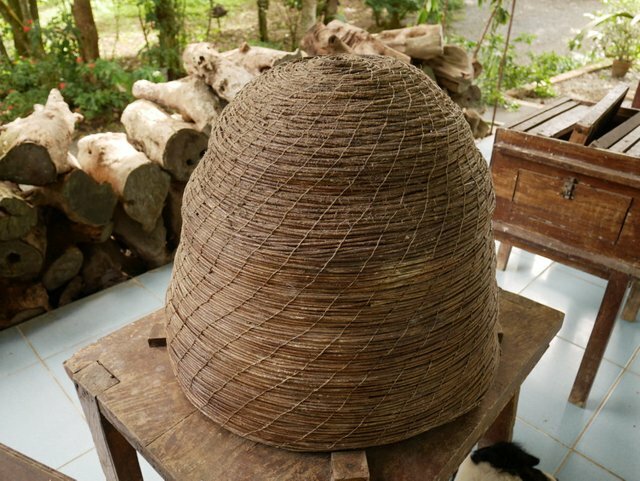 A lot of beehives were made from natural materials like old wood and coconut shells. I am not sure how these were bound together. 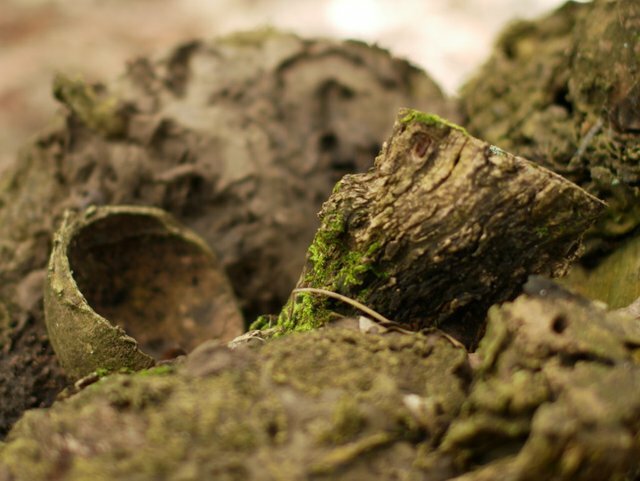 Looks like some sort of mud binds all the materials together. Each of them had small entrances where you could see bees flying in and out. The thing that surprised me the most is the size of the bees. I could not believe how tiny they were, almost like the size of a fly. 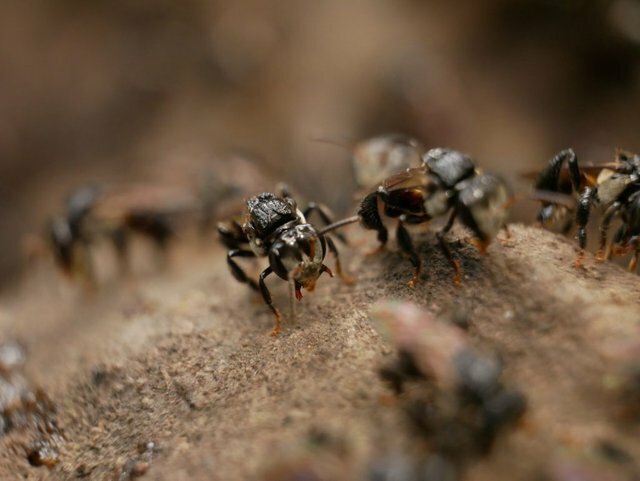 In spite of their size, they are known to produce more honey and they are also resistant to diseases. It is amazing how these tiny creatures create so many products which are very healthy and beneficial to us. Each one doing their part to benefit the colony. With their tiny size it is very hard to focus and get a clear shot. Also I did not hear any buzzing sound from these bees. They seem to be very docile and calm as they were not flying all over me. I do not know much about bees and I only see videos of people with protective gear when approaching a bee colony. 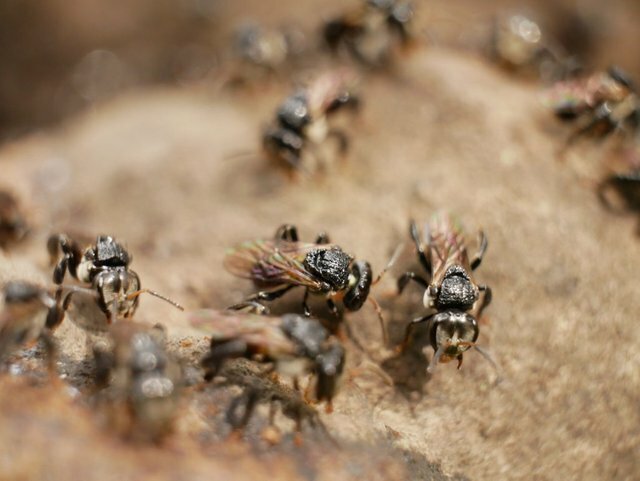 I never realized there is a stingless bee species that existed. Since there is not chance that we will get stung. Let's have a closer look at these sweet creatures. Back in school we were taught how they help pollinate flowers and fruit trees. Nectar is collected and then taken to the hive to feed the larvae. 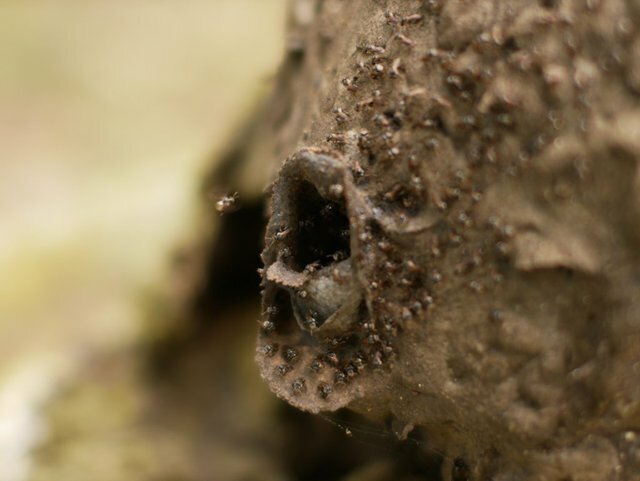 The nectar is stored in their stomach, regurgitated and transferred to honeycombs for storage. 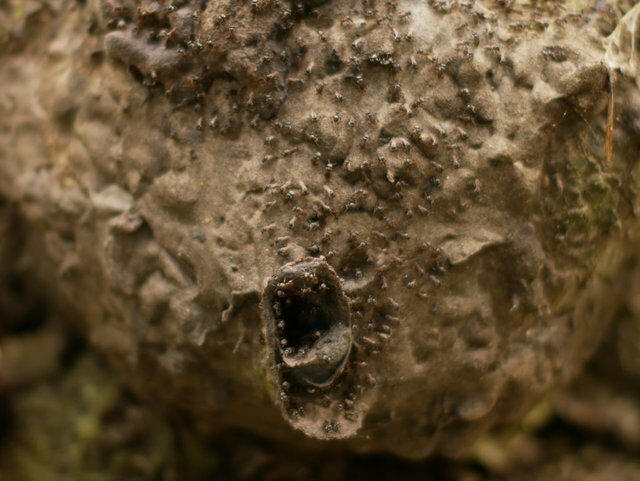 Here you would notice the waxy surface of the hive from the outside. The same material which makes up the honeycomb that stores the honey. 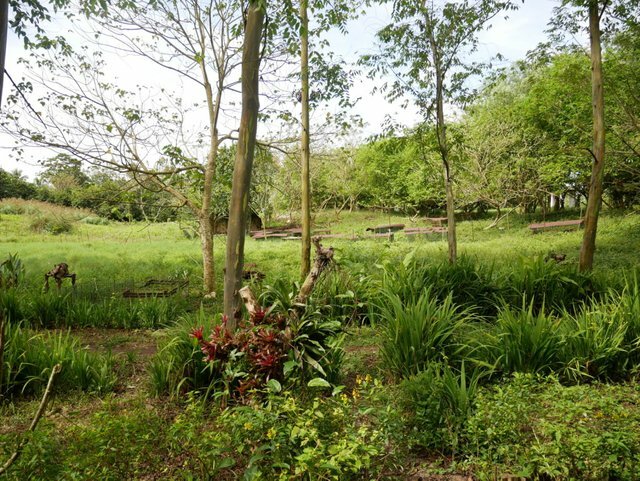 The farm has so many plants and trees. 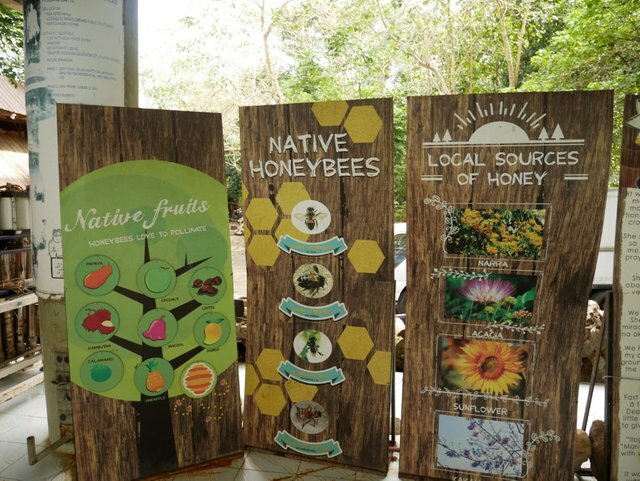 One of the sources of the nectar that the bees collect is from the Narra tree, also the Philippine National tree. It has tiny yellow flowers and when they fall it is like a yellow snow that fills the ground. 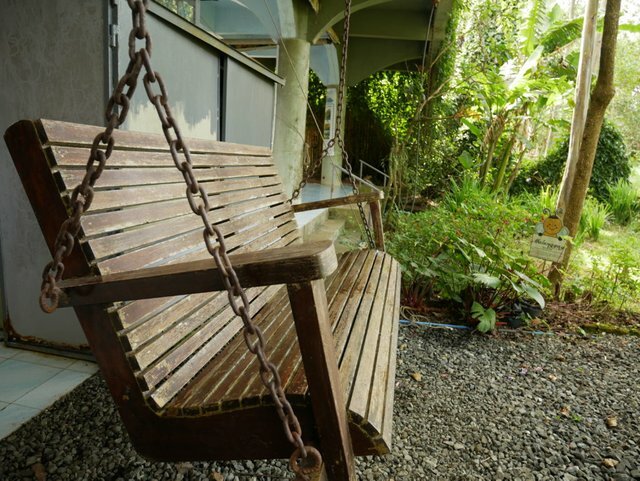 The place is perfect to just sit back and relax for a moment. 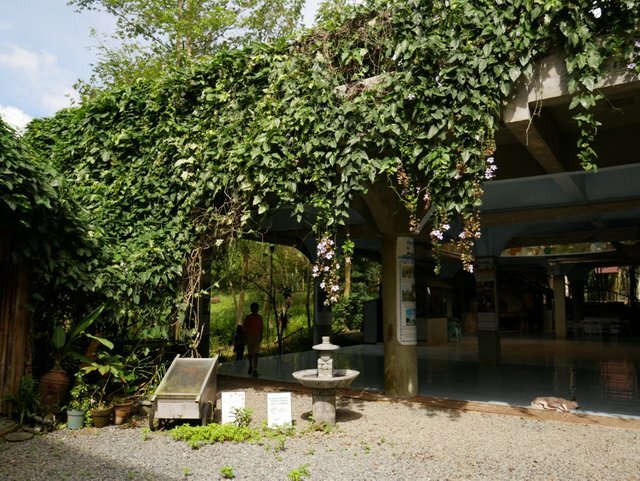 Connect with nature and just enjoy the wonders of nature surrounding the place. Everything is inspired by bees including this small structure. 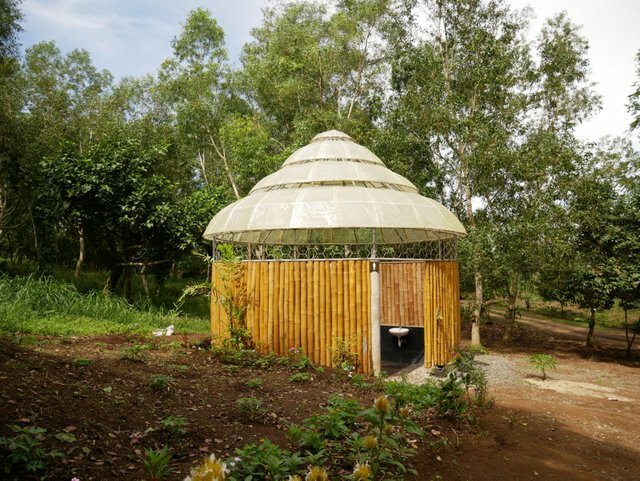 With the honey comb roof and hexagonal shape designs. I do not know if you could guess, but this is the comfort room separated in the middle for ladies and gents. 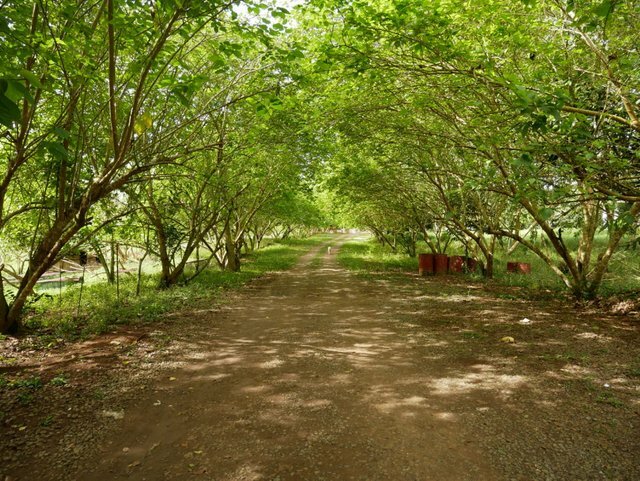 Take a stroll and explore the surroundings. Most of the plants and trees has descriptions on them including it's vitamin contents. 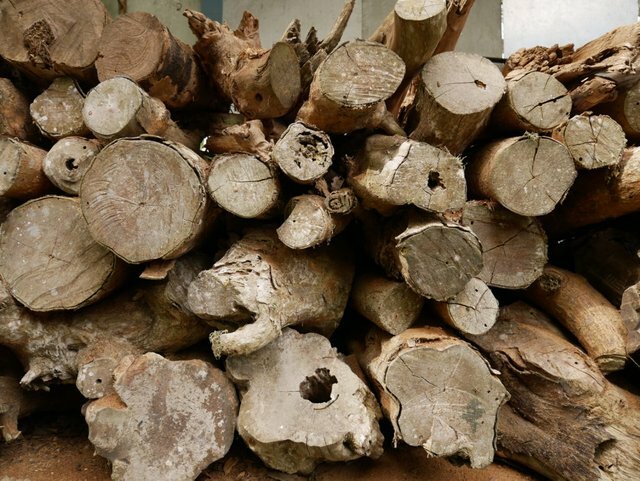 Piles of firewood are stacked in one place which are probably used as fuel in making bee products. 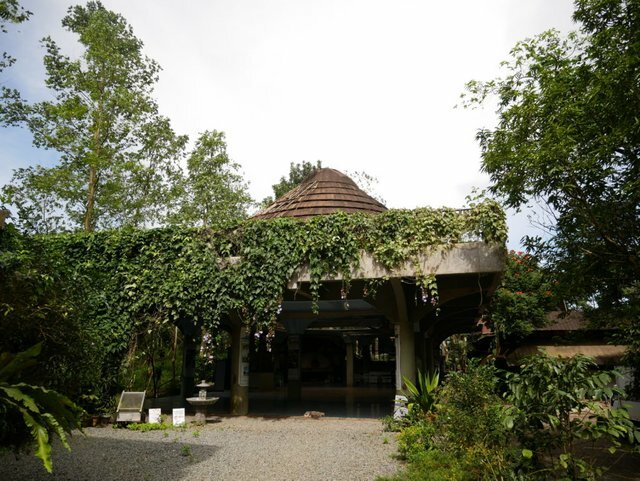 Another attraction in the farm is a small museum which houses old equipment that they have used for the past years. Inside a short story about the farm can be read, including how they started the business. This shows the fruits that are native in the area and it's connection to the bees. 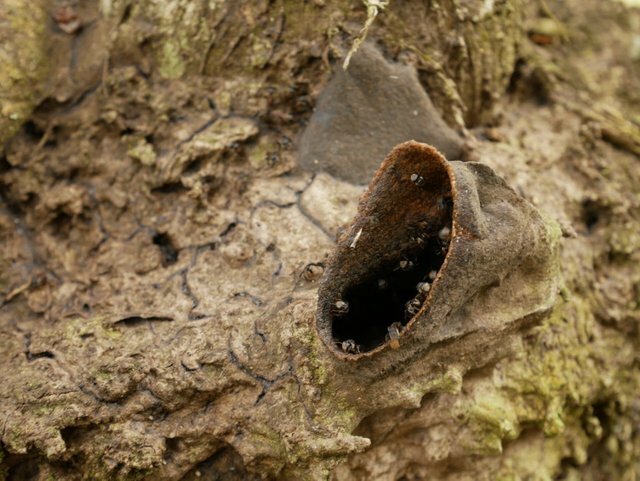 It also shows different types of bees, but we only saw the stingless ones. The other bees might have been there, but probably not advisable as some could give a very painful sting. 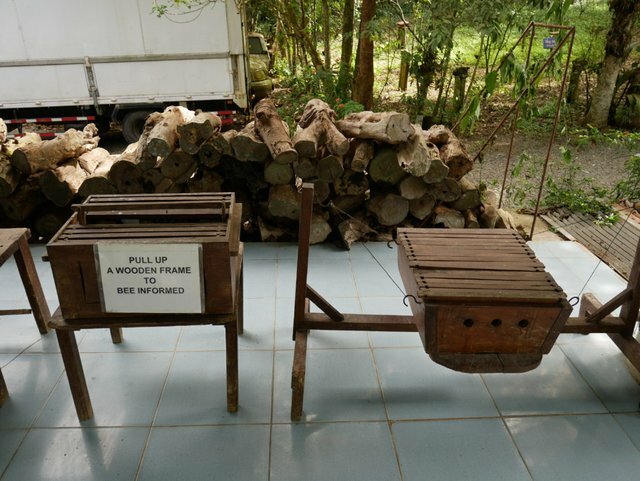 Here are some old bee hives that they used back in the days to produce honey. Now on display they are used for educational purposes. Pull each layer and you would get more information about the bees. This one looks like a woven bee hive and almost looks like something to catch fish with. 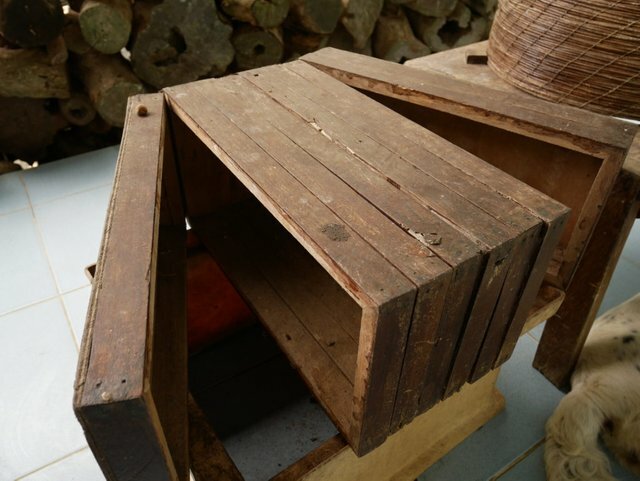 These wooden boxes gets filled with honeycomb and easy to access once they are all filled up. 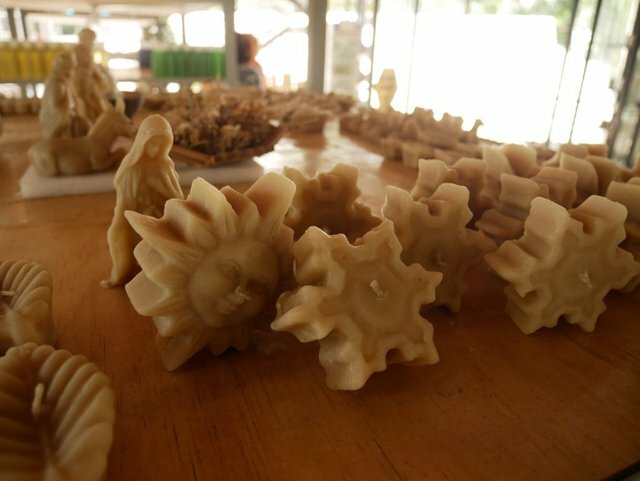 One of the popular products that they manufacture here is soap infused with bee products. I guess you are wondering what the soap looks like. Just to mention they have a shop here with amazing products. 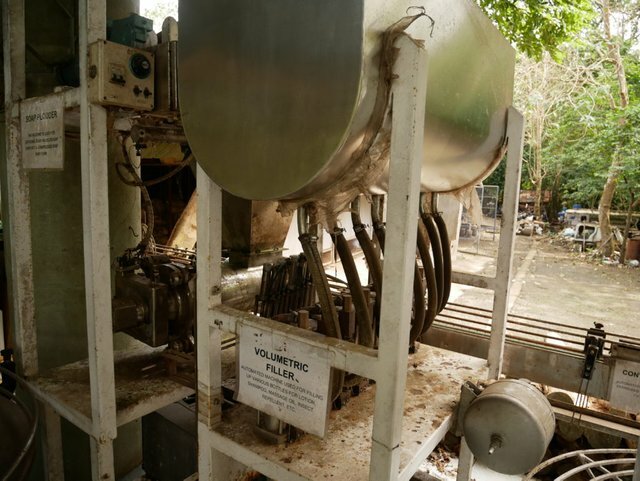 An old extractor that they used for the honey. 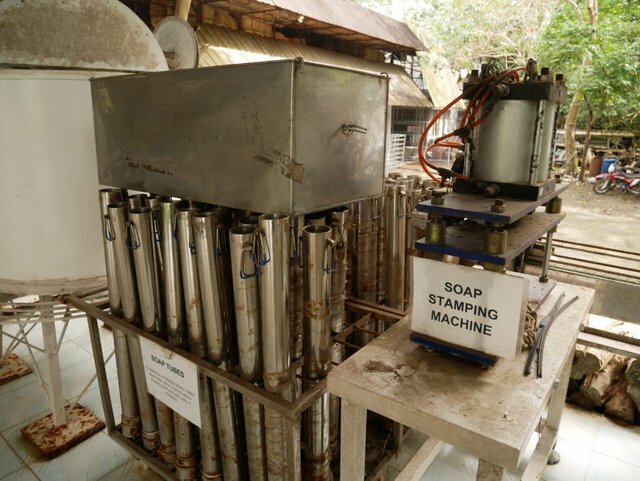 A bottling machine for oil, lotions and shampoos. I could imagine that they manufacture a lot since they required this type of equipment. 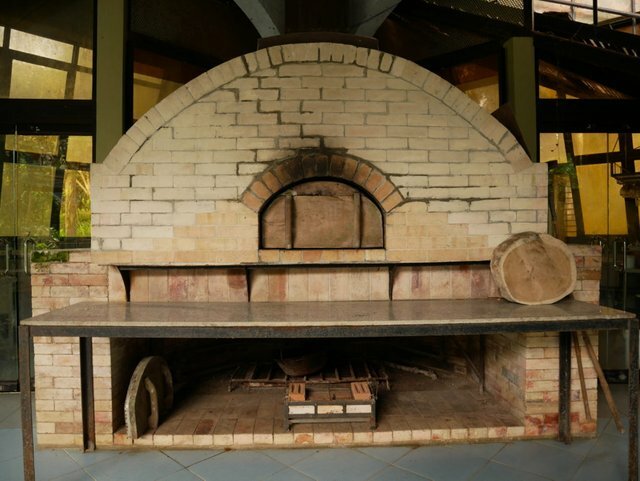 A brick oven that I always wanted to have. Maybe they used to bake bread infused with honey as it looks like it hasn't been used for some time now. Bees can be seen almost everywhere including this painted glass. With the amber colored honeycomb I really love this piece. 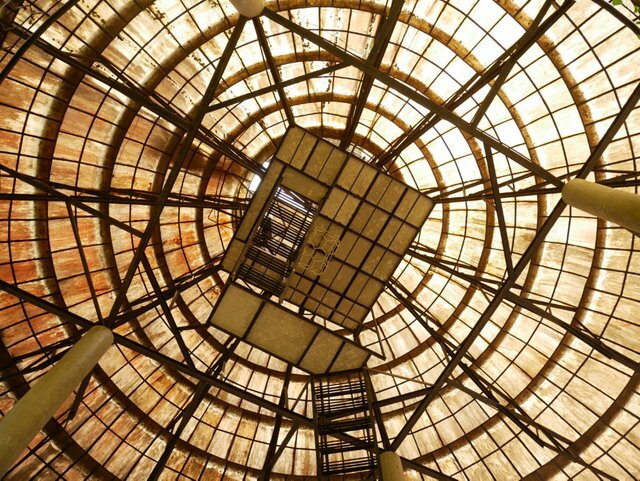 Look up and you would see light shining thru the bee hive shaped roof. I think there is access to climb up there, but it is off limits to visitors. The roof could need a little bit of cleaning though to get more light. We have seen the bees and a museum filled with old stuff that they used. Now let us visit their shop as earlier when we arrived cars were coming in and out of the place. Like buying something from a grocery store and going on their way once they got what they needed. I was wondering how come they did not go around the place. It is probably they are regulars who have already seen everything and just needed to buy honey or a soap. Disconnect from wifi, re connect with nature is something we all need to do once in a while. It seems everyone is always connected all the time from waking up and before going to bed. A walk in the forest, a quiet time near a stream or just listening the the waves of the ocean. We all need to re connect with nature to heal our mind and soul. 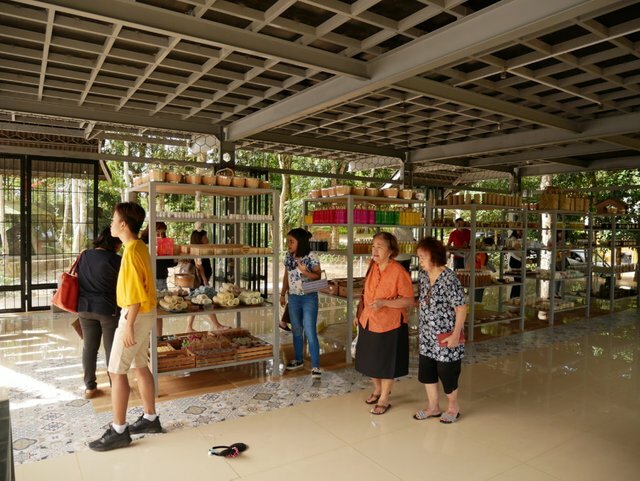 The shop has no walls and the items they are selling are all well organized in shelves. A few people are shopping today and let's see what we could buy. This is an anti bacterial throat spray. The spray is made from virgin honey, propolis, peppermint and spearmint oils. 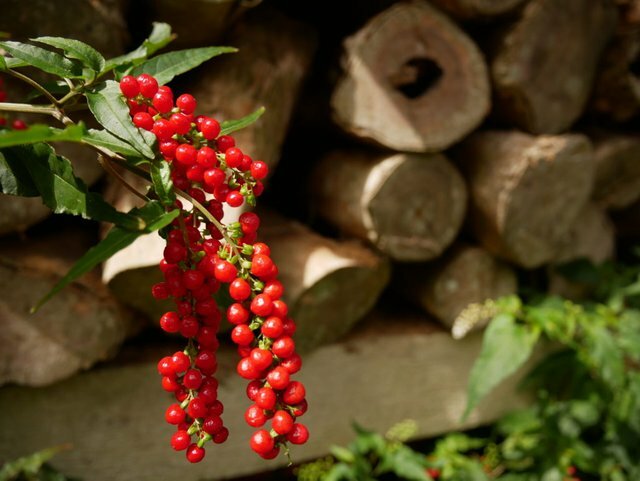 It is good for coughs, sore throat and can even prevent colds and flu. 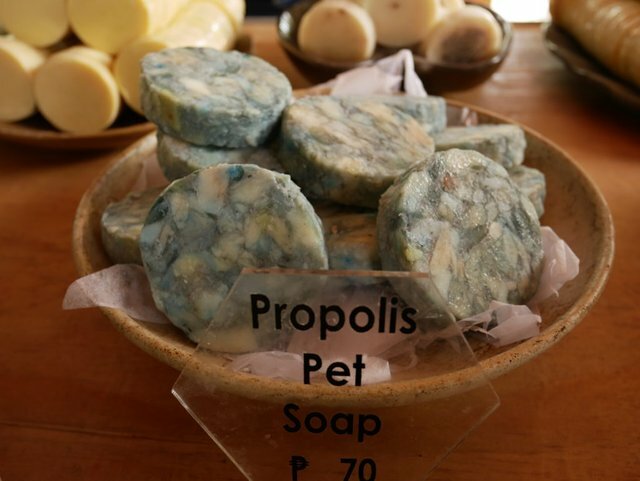 Propolis is a bee product made from it's saliva and bees wax. 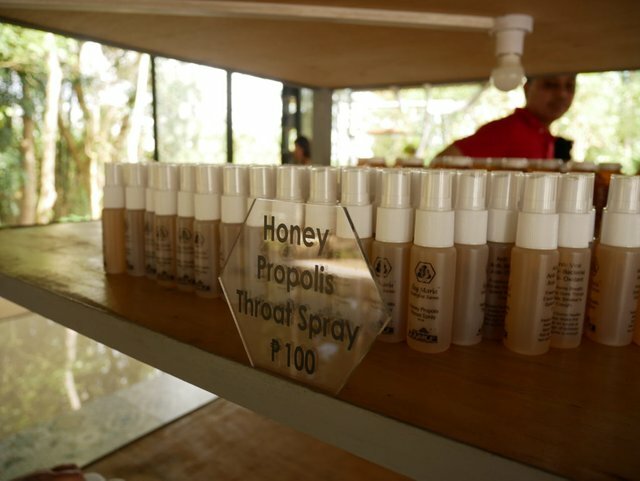 Cost of the spray is 100 pesos or almost $2.00 USD. These pellets are said to contain complete vitamins and minerals. 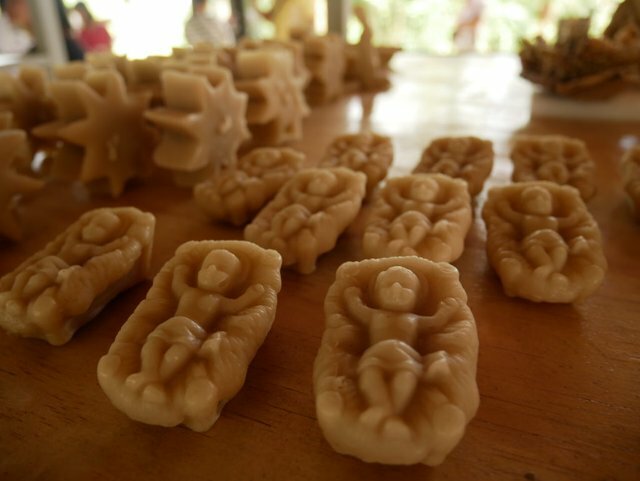 It is used to give extra stamina and are used by athletes, farmers but for city dwellers small doses are recommended. 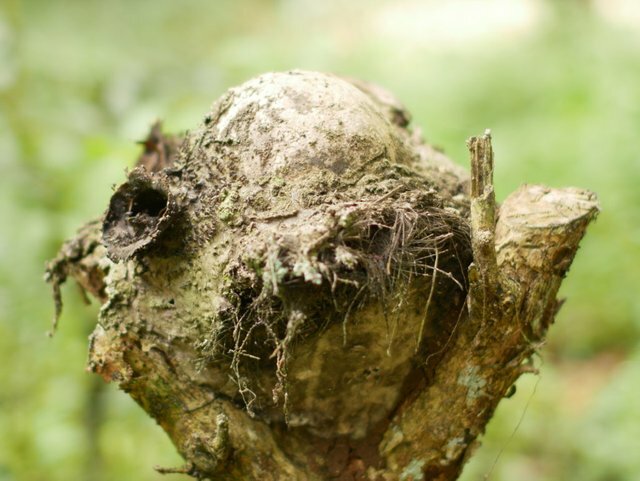 Now this is very interesting and all natural. Now wonder those bees never run out of energy. One scoop is recommended before breakfast. Cost of 33g is 100 pesos or almost $2.00 USD. Detoxifies the body, a natural tonic, helps with digestion and constipation. One table spoon is recommended before breakfast. Cost per bottle is 180 pesos or $3,45 USD. 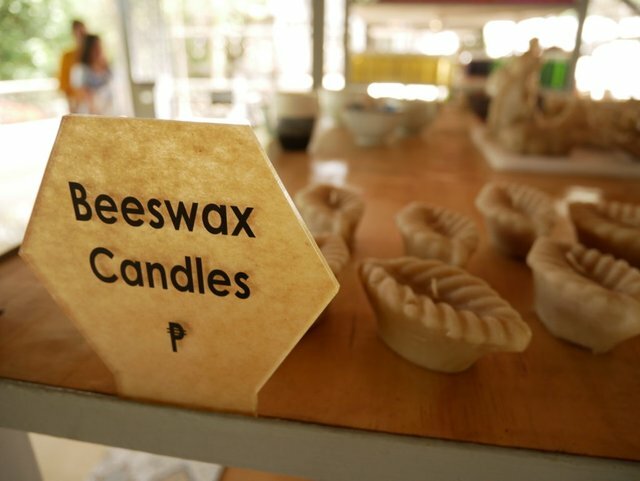 Candles made from beeswax are smokeless and once burned gives out a honey fragrance. That is something every home should have. 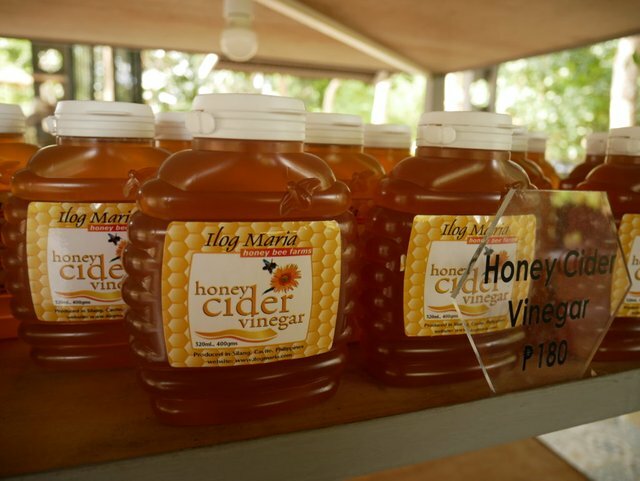 Give your home a sweet smell of honey and take one home today. Cost varies size from 100 - 200 pesos about $2.00 - $4.00 USD. Here are a few of the designs of the candles. 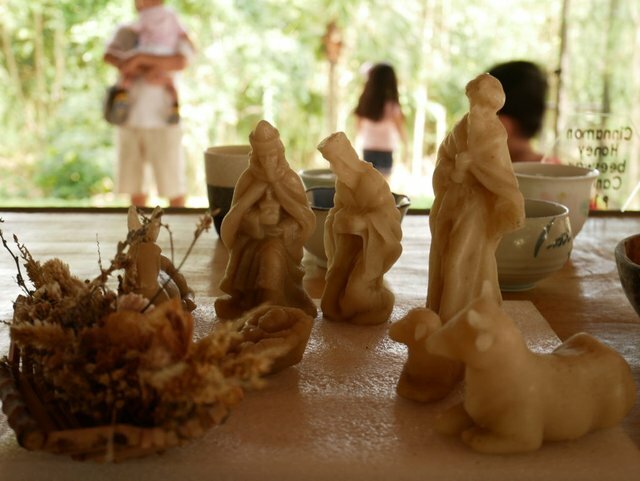 Complete the Nativity Scene, but it would be a shame to use them as candles. It looks too good just to burn them and would be best just to use them as a decoration. 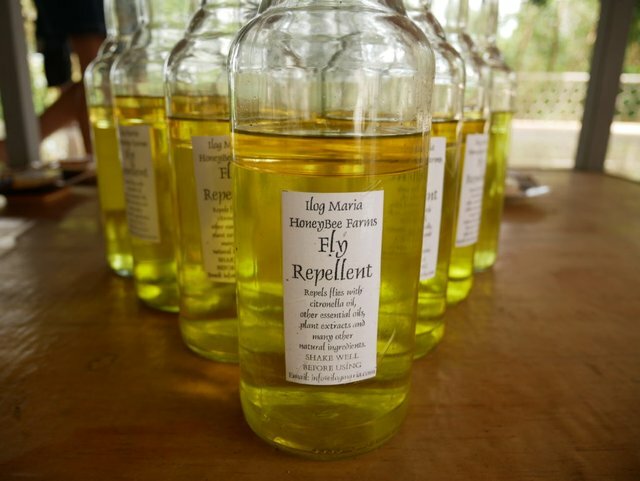 Made from citronella, rosemary, lemongrass and natural oils. It will repel flies, mosquitoes and cockroaches. Spray a little on a candle and you could have the perfect lighted dinner table outside without any pesky flies. Also safe to use as a skin mosquito repellent. Cost 330 pesos or $6.33 USD. 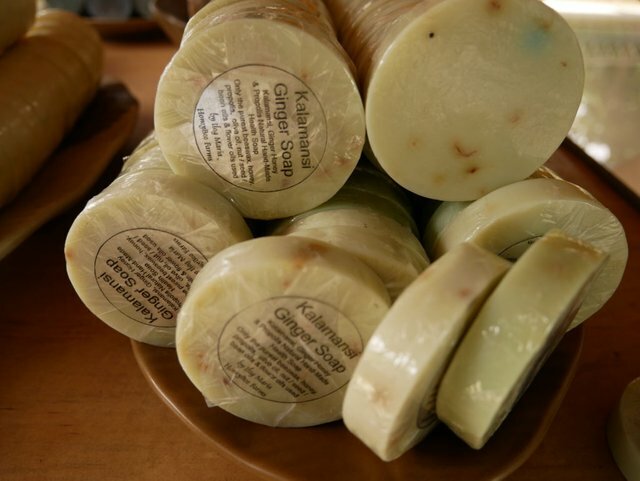 If you are very particular is the soaps that you are using, you are in for a treat. They have a lot of options to choose from. 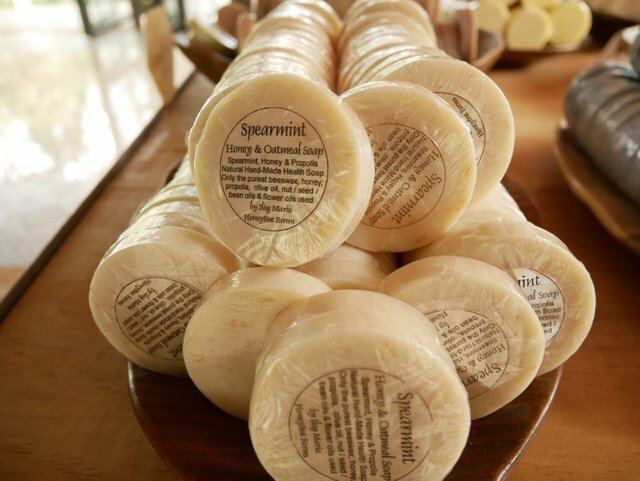 Infused with all natural ingredients they have the perfect soap for you. Cost starts at 70 pesos or $1.70 USD. Has a skin whitening effect, help with dryness and itchiness in skin. They have a nice little box and perfect as a gift. 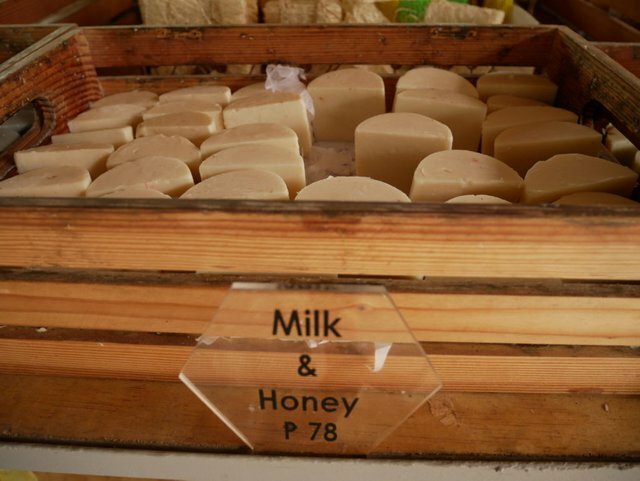 Made from honey and water buffalo's milk it is used to moisturize the skin. It also gives the skin a natural balance. Talk about of bathing in milk and honey. 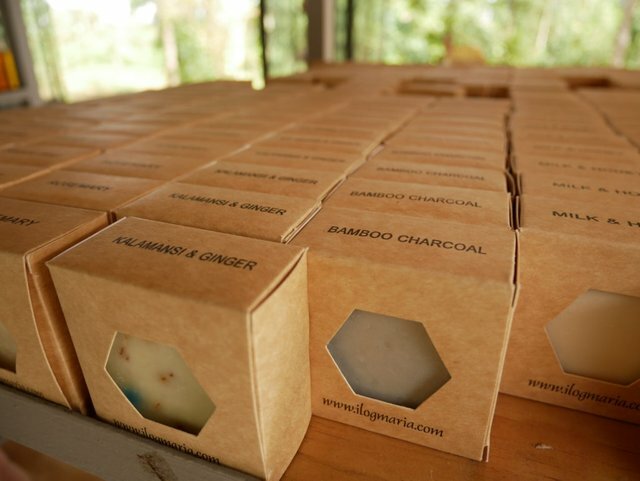 Made from charcoal planted in the farm it is infused with bergamot and lime scent. It also whitens the skin and helps strengthen the bones. Best used as a hand soap before and after eating. It removes odors from food and as a deodorizer. 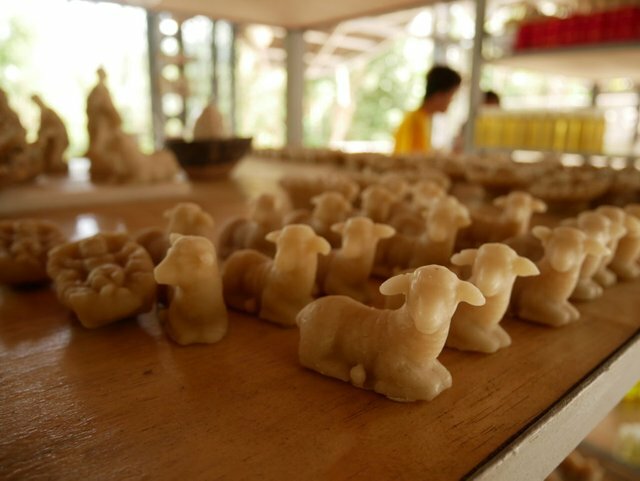 Give you pet a sweet honey scent with the pet soap that they also offer. Best for sensitive skin which is very cool and refreshing. If you have a hot weather this soap is for you and can also treat rashes on skin. Ever wanted to invigorate your mornings? 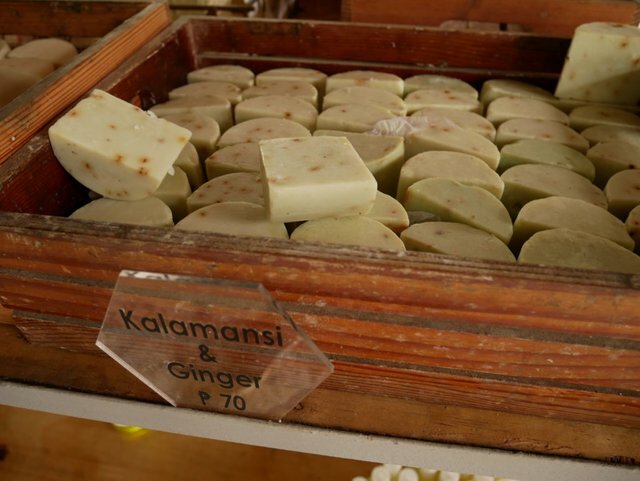 Try this soap as it revitalizes and stimulates blood circulation during your morning bath. It can also help with muscle pains, an impressive skin cleanser and stain remover. To start, this soap relieves headaches, hair growth stimulant, helps fight dandruff, stimulates the brain and kidneys, relieves depression. The list goes on and on for this soap. I think this soap says it all and is best in stimulating almost anything. My aunts and the kids were busy selecting which soap is best for them. Giving each soap a smell and reading the properties of each variant of soap. 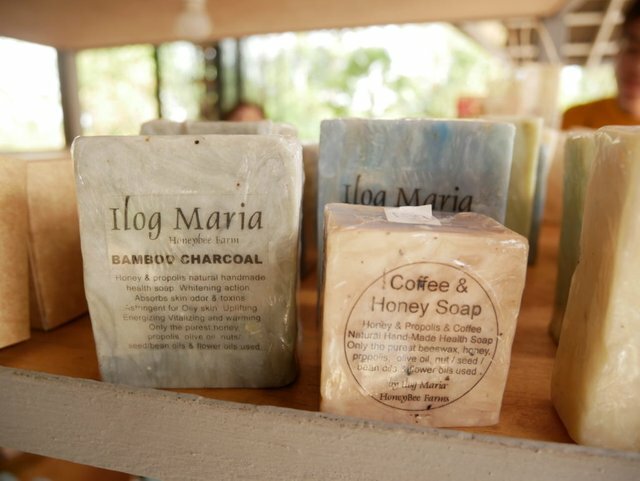 I of course already know which soap to buy.....the soap that says it all. 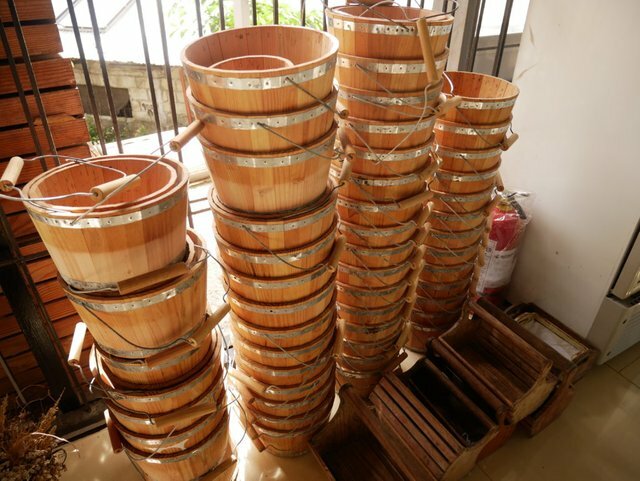 They also offer home accents or decorations including this lovely hand made wooden bucket. 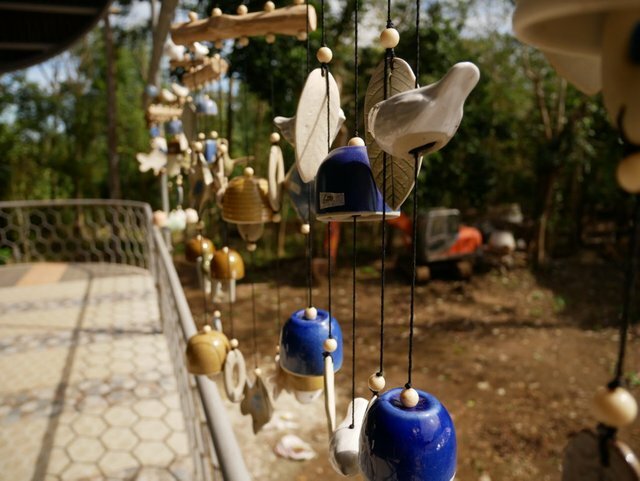 Wind chimes made from ceramic will surely make you want to sleep as the wind blows. Painted glass, but I liked the one inside the museum. 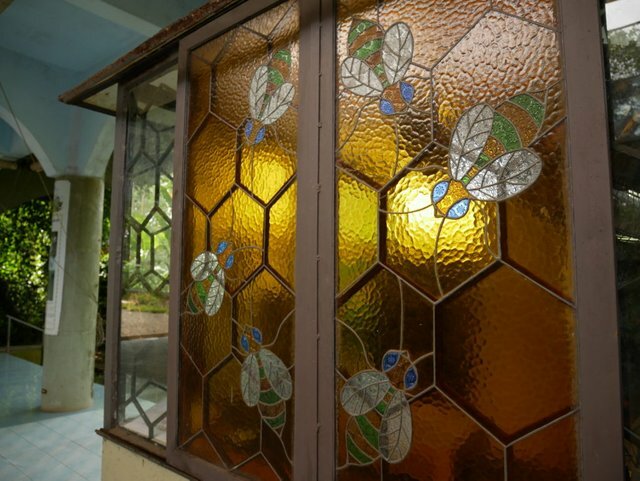 The amber honeycomb painted glass is something I could not stop thinking about. Finally, the crown and glory of the farm. What I discovered from them is they only sold a maximum of two bottles per customer. They do this for the stock to last and they do not want to over harvest the honey. The honey that they harvest is only the surplus from the bees doing so prevents their bees from being stressed out. It is advised to not use it as a sweetener, but for medicinal purposes. In regards to medicinal purposes the list goes on and on. Examples are treating colds, fever, wounds, cuts, stomach problems, burn and there are so much more. They advise the customers not to insist for more honey as they cannot negotiate with their bees for more honey. I love this place as I know how much they care about their bees and not thinking about only the profit. This place inspired me and if ever I get a piece of land I definitely will have bees and some bee hives. 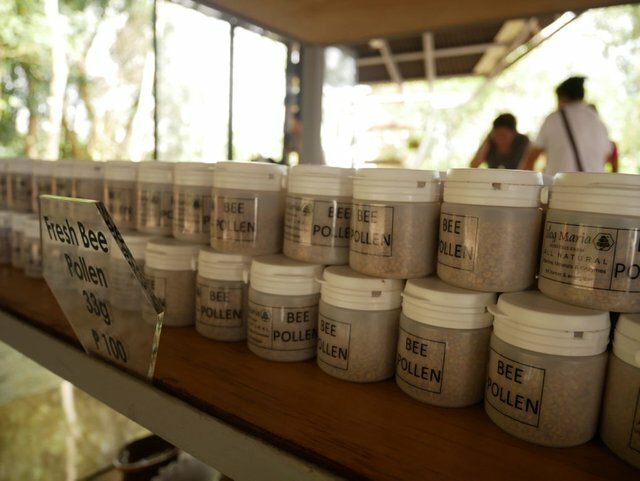 To those who have a peaceful quite place not such a bad idea of starting your own bee farm. Thank you for joining me and the bees today in this wonderful farm. I hope you had a great time walking with me. Anything that caught your interest just let me know. Please do leave some comments and let's talk about bees. If ever you are interested in purchasing their products I do believe they sell online. Just visit their official website on the link. As a disclaimer, this is not a paid content by ilog maria and medicinal claims on products are based on their brochure. Wow, what a beautiful and marvelous post! 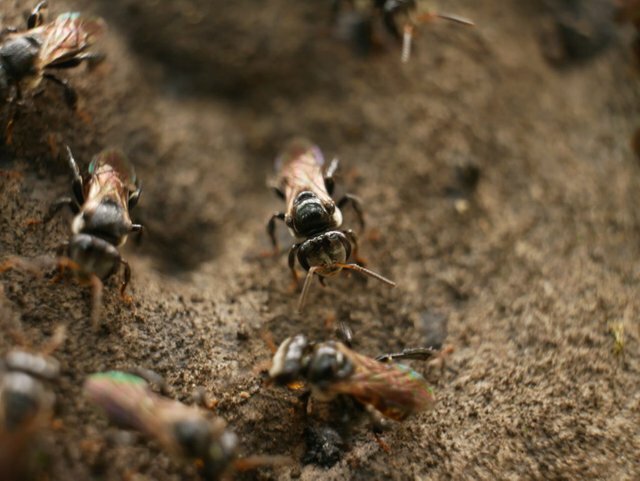 Bees are such awesome creatures... and (of course!) I love honey. 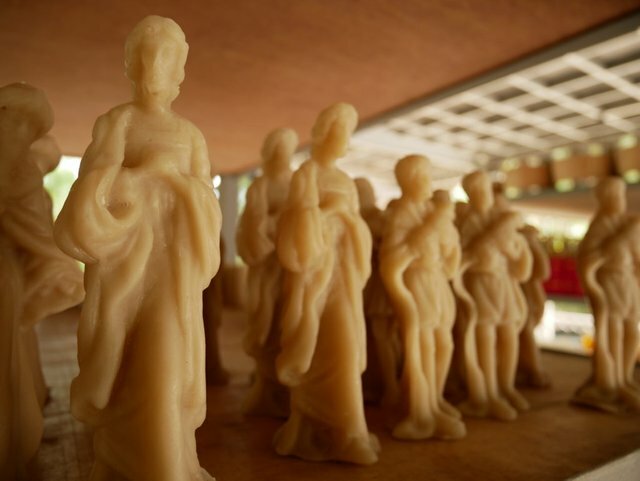 And the lady who has the store next to our art gallery sells marvelous beeswax candles, too... I have a good appreciation for the versatility of bees. My appreciation for bees has grown ever since I visited this place. Much to learn from them as they are very hard workers. We were not able to buy some candles but I would love to try them. Have you tried it? I'm still wondering if it is really smokeless and if it gives out a honey scent. Thank you very much for visiting my post, very much appreciated. The beeswax candles I've had have not been entirely smokeless. However the smoke would not be toxic like paraffin candles and is actually purifying. Exceptional article @watersnake101. Love all your images of the bees and also the location of them. Must have been a wonderful place to wander around in. Oh wow thanks for the insight. I should have bought one candle to experience it. A great place to visit. 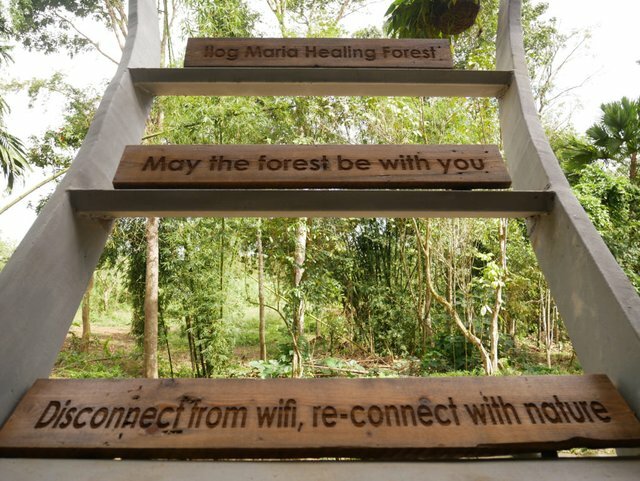 The name of the place Ilog Maria, Ilog actually means river and missed to see the river. Just another reason for us to come back and visit. Thank you very much for the kind words. I really appreciate it. What a lovely place! I didn't know stingless bees were a thing. How cool. 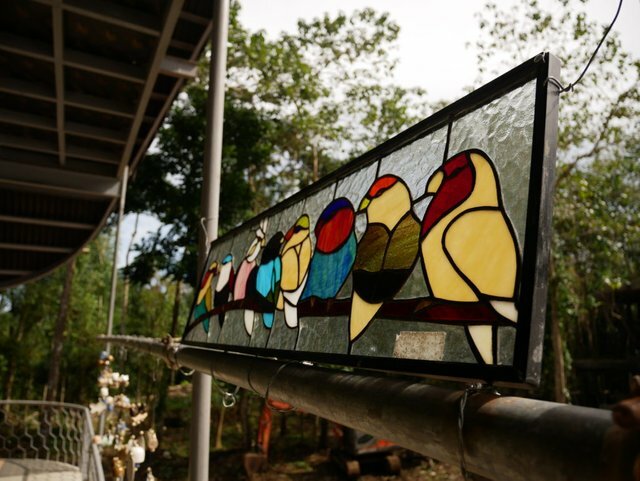 And that stained glass was beautiful! Thanks for sharing your trip. 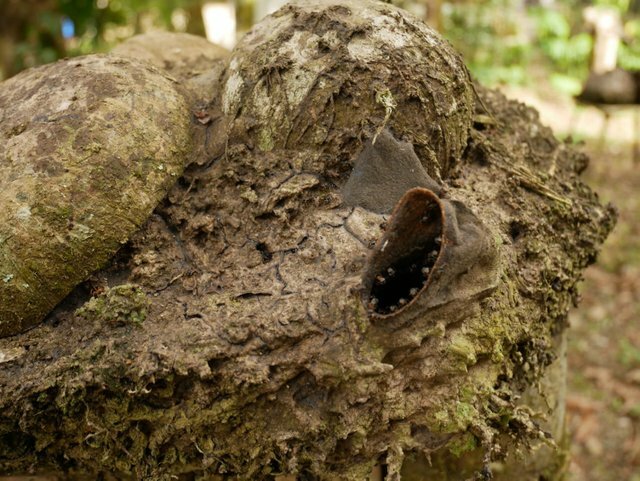 Those stingless bees are really amazing creatures. 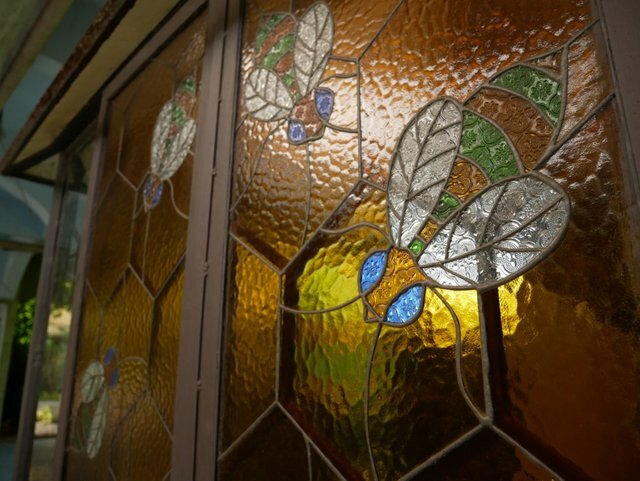 I really love the bee hive stained glass and I wanted to take it home with me lol. 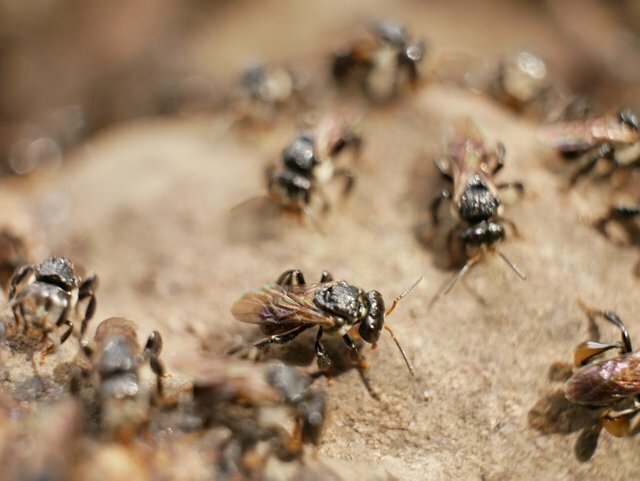 Any idea how the stingless bees protect themselves and their hive without a stinger? We were warned not to stress them as they could give a nasty bite. Ooooh, biting bees. That sounds worse than being stung somehow. Interesting name for interesting place. Ilog maybe becomes ulog? Ha ha ha didn't think about that. Ilog actually means river and since you mentioned it. I was so busy with the bees I forgot to look for the river. Thanks @ace108 as always. This is one amazing post. So thorough and atractive. Spectacular report. This is the way all companies should conceive themselves. A fantastic product (what can be better that sweet honey? 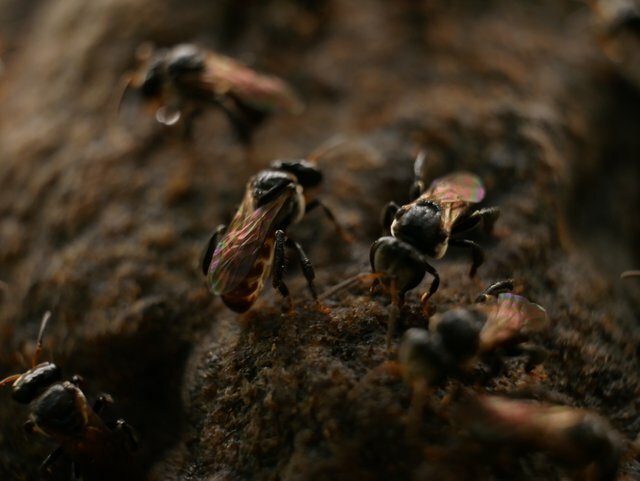 stingless bees! 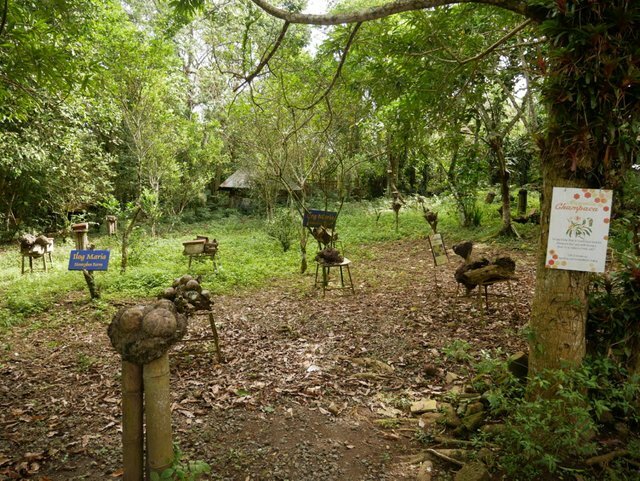 ), a whole tourist industry built around it, a perfect balance with nature. Incredible. Go Philippines ! True they do not abuse nature and keep things in balance. I am very glad you enjoyed my content it means a lot to me. It is really something I enjoying doing sharing places around our area. Although not grandeur every place has its charm no matter how simple. Thanks again. Interesting story about bees! These bees are different from the ones I've seen. I'm afraid of bees, even though my grandfather bred them. I remember as a child in the garden constantly flying bees that could sting. I've never heard of bees that don't sting. When you think of bees you always think about the sting. That painful sting, got stung once when I was a kid, Just could not tell if it was a hornet or a bee. 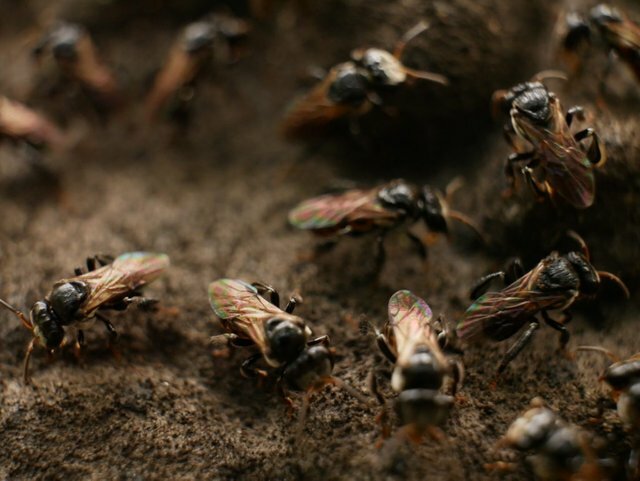 I myself was surprised about those stingless bees. Would be nice to have them around. Great photos, writing and tour. I showed my husband as we are interested in bees. The story about the mother is wonderful. The rain came yay! Oh you should start a colony if you have space. You get a gift from nature and the possibilities are endless. I was amazed with the bee products. Yes and their prayer saved the farm and what is odd about it, from the complete story it seems that the rain only fell in their area. A very warm welcome for my first post as #powerhousecreatives. Thanks to my amazing family. 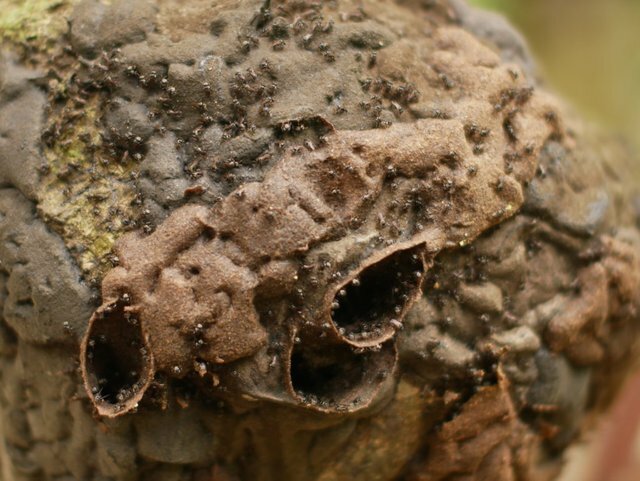 I didn't know that there are stingless bees, either. What a fascinating place to have visited. 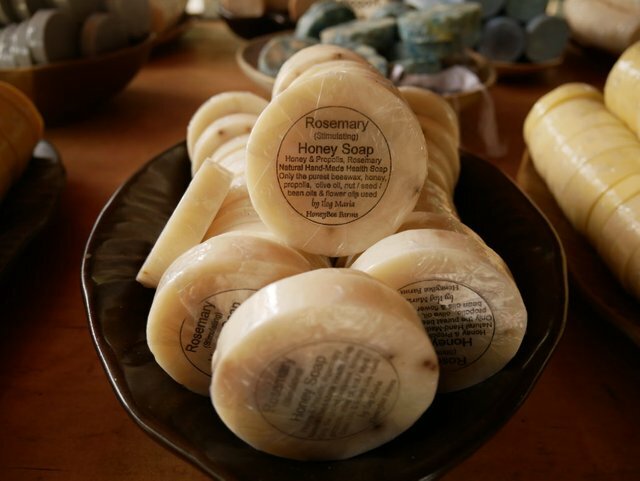 Honey and bee products have such amazing properties. We are fortunate that the stall holder next to me at our market sells raw honey (what we call virgin honey). My house is never without it! 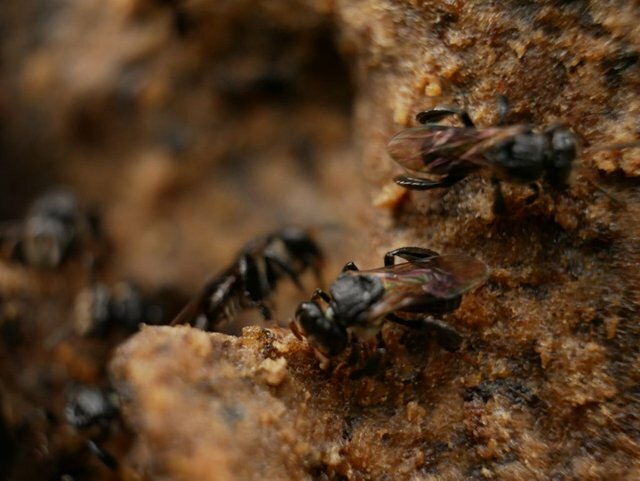 Those tiny stingless bees are amazing and they make a lot of honey too. You are indeed very fortunate to have access to virgin honey easily. 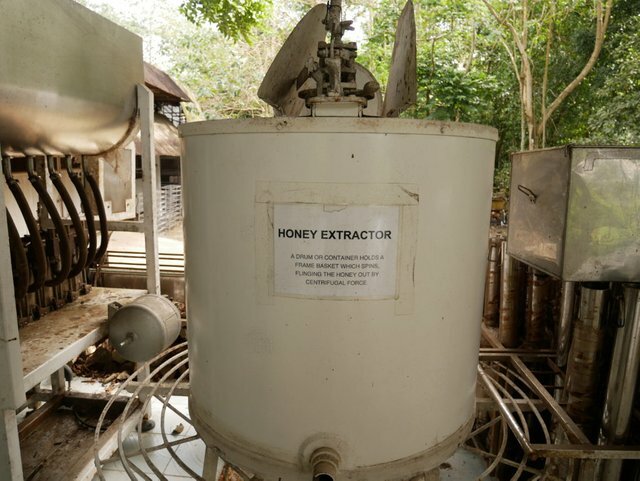 Here there are honey that are fake made from sugar so it is always best to buy from reputable farms. Unfortunately this place would take two hours to get to from where we live. It is nice to always have honey at home. 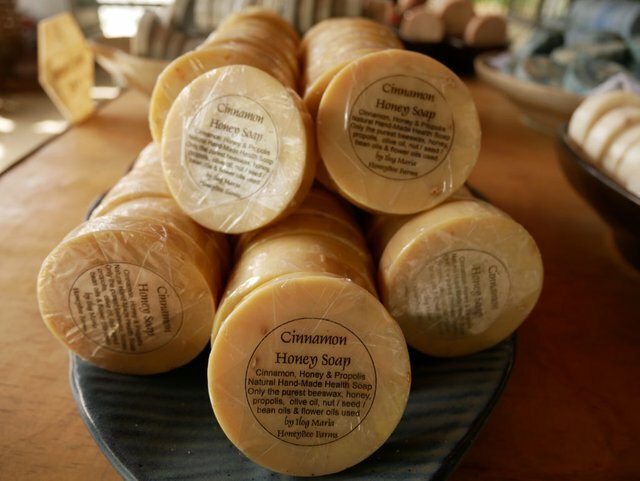 Ah you love the honey soaps. What is your favorite? There were more and I couldn't post all of them. hello @watersnake101! I have heard a lot from my cousin who went and visited this place and, its as amazing as she described it! Thank you for the pictures- it helped me visualize her descriptions. The place is remarkable! Hey there. How are you? It is an amazing place and I hope you could visit it one day. The place is so quiet and relaxing. So many interesting stuff to buy and what I was told their products are also sold in malls. The mark up price when it reaches the malls are much more higher though. @watersnake101 WOW. 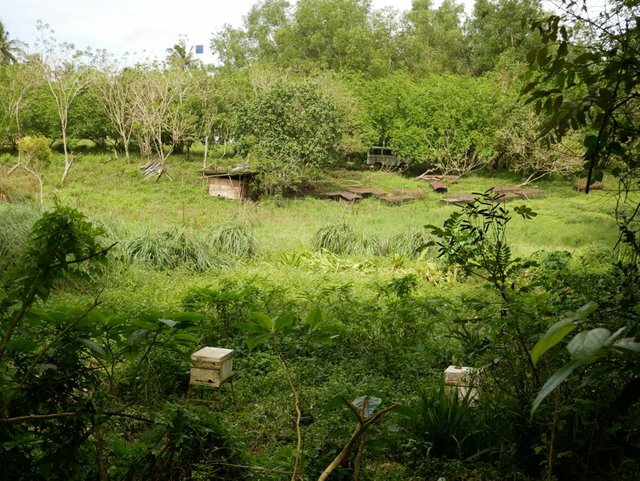 Which part of Philippines is this bee farm located in? 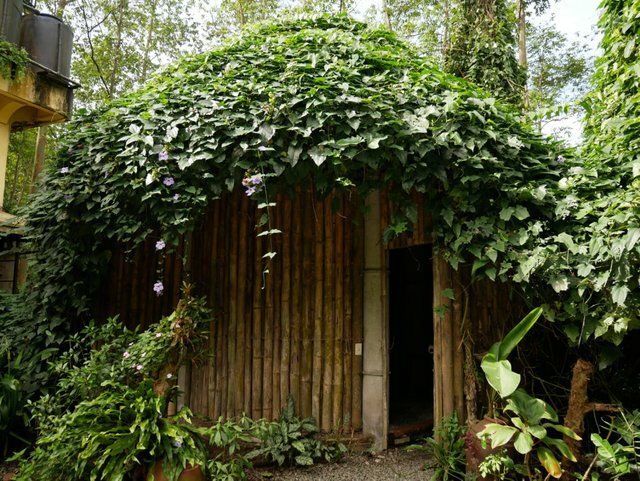 It's in the province of Cavite in Silang which is minutes away from Tagaytay. 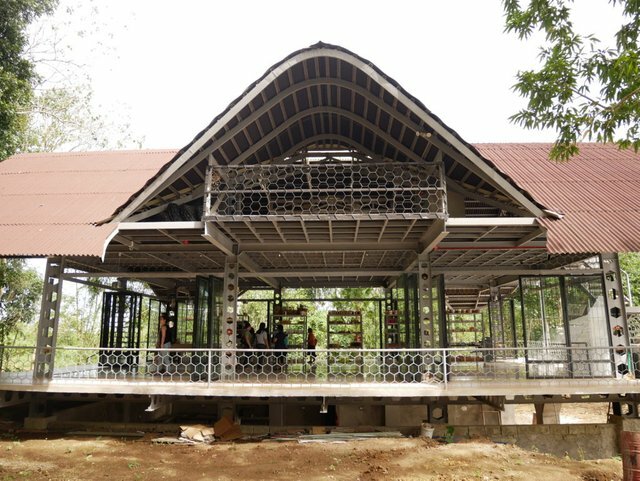 Do visit as it is worth the trip. Thank you very much. I hope you didn't find it too long. Wonderful photos @watersnake101! Also, thank you for going the extra mile and giving such a detailed account of your visit! You are very welcome my friend. I wanted to share our experience in the best possible way. Thank you very much for the amazing support and to the curator. The support means a lot. Hey thanks for having a look. I appreciate it. I have to admit this is the longest I have ever written. Wanted to share all the details that I can. I hope you enjoyed it. I did, but you can do a triptych to, not everybody Will read untill the end i think and thats a waste there was so much good info loved it! That would be a great idea and I wouldn't need to pressure myself too much lol. Cheers! This is an amazing and comprehensive post about your beautiful journey into nature and the world of bees. I learned several things and I enjoyed the post, a win-win situation. Thank you so much. It was a beautiful experience for us too. Got me interested in bees and its products. If ever we get to own a big space for sure there will be bees in the garden. Wow what a report! So much great info and images! My daughter has recently become very interested in the different kinds of honey and we have always planted flowers to try and help the bees. It is DEFINITELY recommended that you take your kids on a field trip to a bee farm. 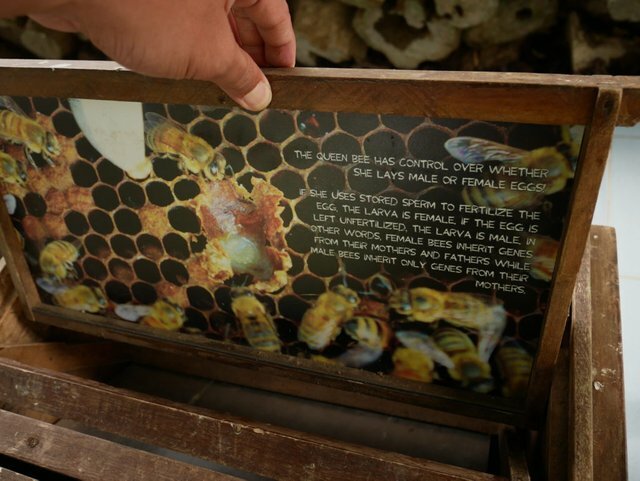 Neat to learn and become a part of saving the bees. One of the most amazing creatures, we need to protect and live harmoniously with them. So much things to learn from the busy bees. Wonderful post @watersnake101. Looks like a full days of activities and relaxation. I had no idea there were bees that were so tiny. They just an amazing creature. It's still amazes me how many people don't realize how much the give to us. I was very surprised of their size. When I saw them I was like, "Uhm are these the bees? Why so tiny?". Size does not matter as they produce a lot of honey. What an awesome post! That place is simply amazing!! I grew up on a farm and we had greenhouses growing cucumbers and tomatoes. We used to have bee hives pollinating them. It's so great to see a business like this who knows the importance of bees and like you said, they really care about them too! I was really moved by their statement, "Please do not negotiate for more honey as we cannot negotiate with the bees to produce more honey." Also smoking is prohibited in the area as was told it would stress the bees. Wow! How absolutely fascinating! 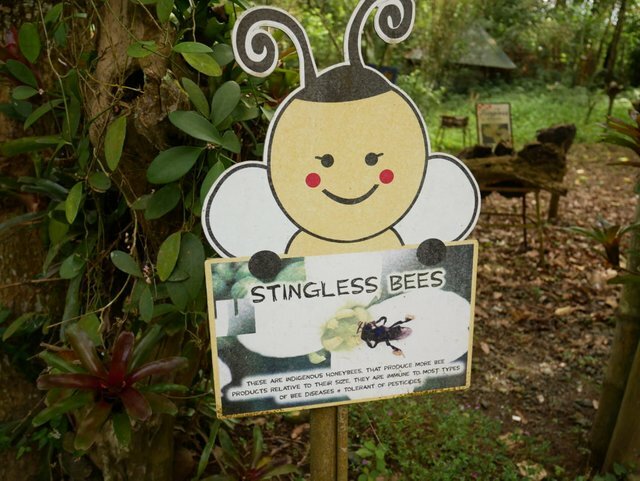 I had no idea there were stingless bees. Thank you for the 'tour' through your day, this was really amazing! I want to go visit there! Glad you enjoyed the tour. 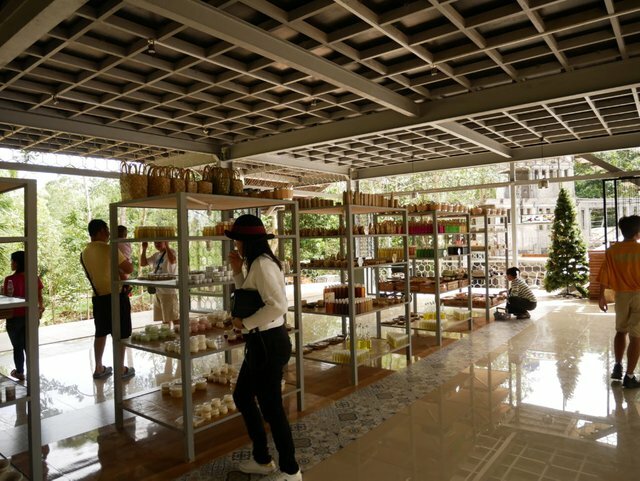 If ever you visit you will be amazed with the products and it would be hard not to buy anything. Really neat place, thanks for sharing it with us and congrats on being selected for the rally vote. Hey thank you very much I appreciate the support. It was quite an experience for me and my family too. 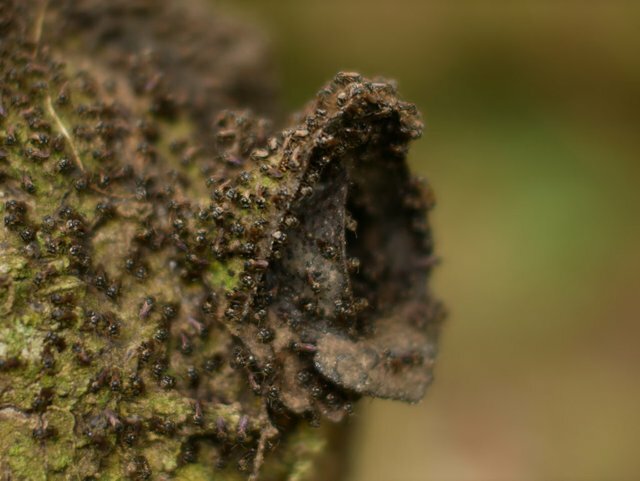 Bees and ants are so productive, work well being organized, noticed many Bromeliad plants in and under the trees. Never heard of sting-less bees, that is what I love about #powerhousecreatives learn something new every day from members. Thanks for taking us with your to visit, bees are one of the most fascinating insects on earth, many do not realize how much they do sustaining life, yes the smallest counts! Thank you very much for such a lovely comment. Those bees really surprised me too, never knew they existed and makes a lot of honey than the regular bees. About stained glass you just don't know how crazy I am about the art. One of the reasons why I love visiting churches around are those stained glass. Themes in stain-glass vary so much, each one a unique design. I prefer the ones of nature, the bees and honey birds were beautiful. Fabulous photos as always! I always learn so much from you!. I had no idea that there are bees that produce honey that do not sting. Hello @melinda010100 it was also a great learning experience for the family. I am always out on a lookout to share fascinating things around our area. I just wish it is a full time job for me lol. Sweet hugs to you from us as sweet as honey. This reminds me when I trained for beekeeping. This place is so much better to train. They seem to have more equipment. I also love how wide the place is. Hey there buddy. How are you? Thanks for dropping by. How was your training in beekeeping? Was it hard? I am also very interested but we just don't have a place out in the province. It was an easy 3-day basic training. The intensive one takes six months and more but I did not pursue it. Very true they work for the community which what makes them thrive. I'm glad you like the pictures it was a bit hard getting those closeup macro shots. It was a great practice for me and good thing they don't sting lol. I so love your shots @watersnake101! You just gave us a wonderful view of the place. 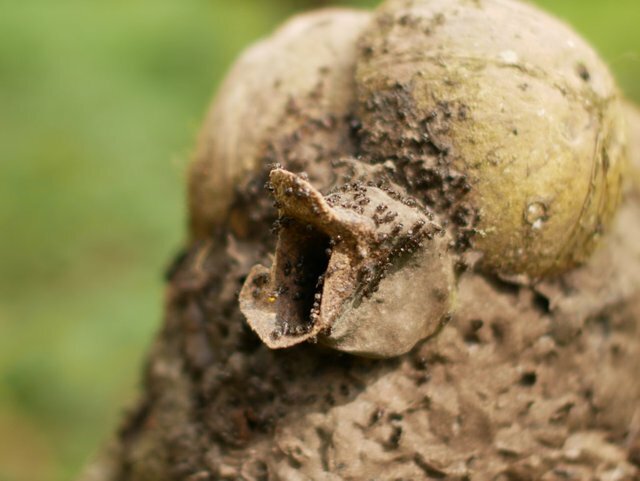 I love how you took the photos of bees! They look so real that it feels like they are gonna come and crawl!